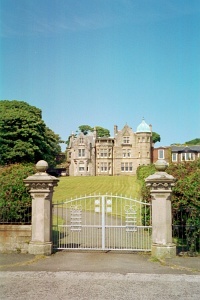 In 1862, a pink sandstone Scottish Baronial house replaced one of the earlier buildings. In 1889–91, this was itself partially demolished and significantly extended by John Honeyman & Keppie for Ninian Bannatyne Stewart in a style derived from 17th-century Scottish sources, using yellow sandstone. The house appears to have been named Dunloe at this time: the name only appears on O.S. maps after this work. The surviving 1860s portion at the S.W. corner is shown in four drawings by John Honeyman & Keppie for the 1889–91 addition. A perspective by Alexander McGibbonand two drawings of the interior – one of the hall – were exhibited at the Glasgow Institute of the Fine Arts in 1891 (778, 779 and 787). The hall and dining room, which have elaborate chimneypieces, woodwork and metalwork, were illustrated in the British Architect in September 1891. 2 A drawing of the hall was also exhibited at the Royal Scottish Academy in 1893 (347). Listing category: B: Listed as 'Wemyss Bay Road, Dunloe and Mansfield, including boundary walls and gatepiers'. 1: David Stark, Charles Rennie Mackintosh and Co., Catrine, Ayrshire: Stenlake Publishing, 2004, pp. 117–19. 2: British Architect, 36, 11 September 1891, pp. 190, 197; 36, 18 September 1891, pp. 209, 212. 3: 'John Honeyman', Dictionary of Scottish Architects, 1840–1980, www.scottisharchitects.org.uk [accessed 13 February 2013]; birth, marriage and census information, www.scotlandspeople.gov.uk [accessed 9 May 2013].